On February 11th 2012, the world was in shock: American diva Whitney Houston passed away so unexpectedly. What we usually see when a star departures (we have seen it already with Michael Jackson) is that record sales soar; the same happened to Whitney Houston. The most popular record is of course ‘I will always love you’, the famous song from unforgettable Bodyguard starring Kevin Costner, the movie that is the top of Whitney’s career. I have always admired Whitney. Her extraordinary, unbelievably beautiful voice touched and still touches a great majority of people, deep down in their hearts. Her songs are close to our emotions, our feelings, our misfortunes and our happiness; in short, they are close to us. Beyond her status of a interplanetary star, Whitney Houston was also a woman, with her hardships but also with success, just like you and me. After her death, her fans have started buying different advertising products more than ever. 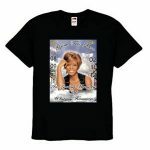 We can already find personalized T-shirts with the most beautiful pictures of Whitney on them as well as with the dates of her birth and death printed on them. All these Whitney Houston advertising items are, in a way, a means for her admirers to honor her death.